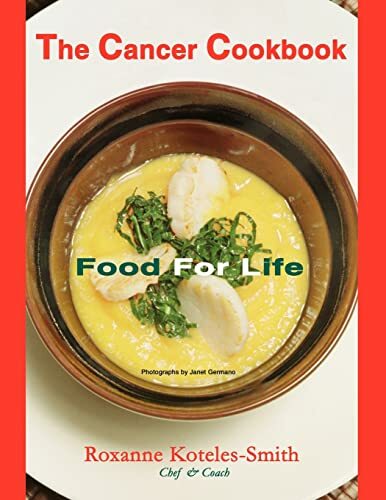 THE CANCER COOKBOOK, Food For LifeFinally, healthier food that taste great. Chef Roxanne masterfully presents beautiful, simple foods with a Japanese influence. Novice to Executive Chefs will find THE CANCER COOKBOOK a fabulous resource for sourcing health to others. Janet Germano?s photos exquisitively represent how easy the recipes are to follow. The food is only the beginning. The success stories touch, move and inspire you to start your own personalized program. In just over 1 year Emilie DeCelles, a grandmother, takes her diagnose of Stage 4 metastatic breast cancer tumor 40x50 mm and cancer marker of 79 to ?tumor not even large enough to quantify with a measurement anymore? and cancer marker to 9.8. Dr. Chuck Witkowski?s story of losing 81 pounds, reducing insulin from 400 units to 10 units and some days none; and no more acid reflux, blood pressure or allergy medications within six months is a great example of what is possible. Brenda Anderson and others? stories remind us how easily we can get our energy, vitality and youthfulness back through foods. Roxanne Koteles-Smith leads wellness retreats; private or group cooking classes; and designs specialized Life Style Plans. Combining New England Culinary Institute education, Ritz-Carlton Corporation and The Breakers in Palm Beach cooking experience with the Kushi Institute macrobiotic certification to present easy access to health through food. Chef Roxanne?s past television shows include ESPN2 teaching N.Charleston Lowgators (NBDL) healthy cooking and Charleston?s Channel 5 WCSC 13-weeks Weight Loss series in early 2001.Roxanne is a board member for ASCEND Foundation (Anne Scandalios Cancer Ends Now Directive) Imagine the World Without Cancer.